Students who are concerned about the use of animals in teaching are responsible for contacting the instructor prior to course enrollment to determine whether animals are to be used in the course, whether class exercises involving animals are optional or required and what alternatives, if any, are available. If no alternatives are available, the refusal to participate in required activities involving animals may result in a failing grade in the course. Departments that include courses where animals are used must actively inform students of such courses through notices in the catalog and other publications. The University of Maryland, College Park campus, affirms the right of the faculty to determine course content and curriculum requirements. The University, however, also encourages faculty to consider offering alternatives to the use of animals in their courses. In each course the instructor determines whether the use of animals in classroom exercises will be a course requirement or optional activity. The following departments have courses that may require animals to be used in class activities: Animal and Avian Sciences, Bioengineering, Biology, Cell Biology and Molecular Genetics, Entomology, Psychology, and courses with the NRMT prefix. A minimum of 120 successfully completed course credits is required for graduation in any degree curriculum; however, individual colleges, schools, and departments may establish higher requirements for graduation. Check with your advisor for specific information. If you feel there are special circumstances that make it impossible for you to complete a normal course load, you must meet with an advisor to discuss the circumstances, plans for continued progress toward a degree, and the implications for continued enrollment. University of Maryland policy stipulates that full-time degree seeking students are expected to complete their undergraduate degree program in four years. To meet this expectation, students must plan carefully in consultation with an academic advisor; complete 30 credits each year (which is usually accomplished through a course load of 14 to 16 credits per semester); satisfy general education, prerequisite and other course requirements with acceptable grades in a timely manner; and meet the benchmarks. Academic units provide the benchmarks and sample templates of multi-semester plans leading to four-year graduation. Students are required to map out individualized four-year plans, consistent with these guidelines and benchmarks, and are responsible for updating them as circumstances change. Students who do not meet benchmarks are required to select a more suitable major. Students who change majors must submit a realistic graduation plan to the academic unit of the new major for approval. Any student who completes ten semesters or 130 credits without completing a degree is subject to mandatory advising prior to registration for any subsequent semester. Students with exceptional circumstances or those who are enrolled in special programs are required to develop a modified graduation plan that is appropriate to their situations. In all cases, students are responsible for meeting progress expectations and benchmarks required for their degree programs. Every student should contact his or her college or department advisor to obtain the relevant materials for developing a four-year graduation plan and required benchmarks. For information about this policy visit: the Office of Undergraduate Studies/Student Academic Sucess and Student Academic Success FAQs. In Fall 2005, the University Senate voted to adopt a policy for plus/minus grading, which was approved by the President. A slight revision to the policy was passed by the Senate and approved by the President in Fall 2011. Beginning with implementation in Fall 2012, plus/minus grading became the University’s new official grading policy. Under the policy, quality points for each letter grade from A through D will reflect plus and minus components of the grade, as shown below. The plus/minus system will apply to both undergraduate and graduate courses. The marking system defines the standards associated with letter grades under the present grading policy. The new plus/minus grading policy does not change these standards. For example, under the present grading policy, students receiving a grade of C have achieved the standard of “denotes acceptable mastery of the subject.” Under the plus/minus policy, students who receive a grade of C+, C, or C- will have met this same standard. To maintain the comparability of grading standards under the plus/minus grading policy with the current grading policy, all academic programs must accept letter grades that include plus or minus as meeting their current minimum grade requirements. This principle applies to minimum grade requirements of D, C, B, or A in undergraduate and graduate courses. In graduate courses, for example, a current requirement of a B would be satisfied by a grade of B+, B, or B- under the plus/minus grading policy. In an undergraduate course, a current requirement of a C would be satisfied by a grade of C+, C, or C- under the plus/minus grading policy. All references in University publications and websites defining current minimum required grades as D, C, B, or A have been changed to D-, C-, B-, or A-. Similarly, all current references to numerical values for minimum required grades in specific courses (e.g., 3.0, 2.0, or 1.0) have been converted to letter grades (B-, C-, or D-). The Graduate School Probation Standard on academic probation and dismissal retains the current GPA requirement of maintaining a minimum cumulative 3.0 GPA. The Graduate School increases the period of study before the GPA minimum standard is applied: “A student whose cumulative grade point average falls below 3.0 will not be placed on probation until s/he completes 12 credits or two semesters, whichever comes first.” This change was made effective August 29, 2012. Requirements that are based on any calculated GPA of grades earned in more than one course continue under the plus/minus policy. For example, the College of Education has a current degree requirement that students must maintain an overall GPA of 2.75. This requirement is unaffected by the introduction of plus/minus grading. The University’s current requirements of a minimum overall GPA of 2.0 for bachelor’s degrees and 3.0 for graduate degrees are unchanged. Stated grade requirements for LEPs have been changed in the catalog and in other University communications, with current minimum individual course requirements stated as C- and B-. For example, LEP requirements that previously stated a minimum grade in a course of 3.0 or B could be met by a grade of B+, B, or B- under the new grading system. Current minimum cumulative GPAs required to enter an LEP remain in effect under plus/minus grading. Cumulative GPAs are calculated under the prevailing grading policy at the time the course was taken. Grades and GPAs earned under the plus/minus grading policy in effect prior to Fall 2012 will not be recalculated using the quality points of the plus/minus policy grading policy that became effective in Fall 2012. The Registrar will make GPA calculations and report them on student transcripts. Transcripts will include an explanation of the change in the University’s grading policy. A minimum 2.00 grade point average is required for graduation in all curricula. A higher average may be required by the individual department, college, school, or program. Beginning with students matriculating in Fall 2012, to be awarded a baccalaureate degree, students must have a minimum C (2.00) cumulative grade point average across all courses used to satisfy major degree requirements, minor requirements, and undergraduate certificate requirements. Individual department, college, school, or program requirements may exceed this minimum. In general, credit from academic courses taken at institutions of higher education accredited by a regional association will transfer to the University of Maryland, College Park provided the course is completed with a grade of at least C- and the course is similar in content, scope and level of work offered at the University. Grades of D- or higher are accepted for appropriate course work completed at a regionally accredited Maryland public institution. (Note: Prior to Fall 2012 grades of C or higher (D or higher from Maryland public institutions) were required for credit to be accepted for transfer to the University of Maryland, College Park). The policies for acceptance of graduate transfer credits remain unchanged. (See http://www.gradschool.umd.edu/catalog/academic_record.htm#10 for current policies.) The requirement of a B is satisfied by a grade of B+, B, or B- under the plus/minus grading policy. Will grades received for courses completed prior to Fall 2012 be converted to reflect the new plus/minus grading scale? Grades and quality points received in terms prior to Fall 2012 will not be changed or converted into the new plus/minus grading scale. GPAs for grades earned prior to Fall 2012 will not change. How will cumulative GPAs be calculated for students with grades earned under both the current grading policy and plus/minus grading? A student’s cumulative GPA will be based on the quality points earned for courses taken under each of the policies. Grades received under the current grading policy (prior to Fall 2012) will receive quality points awarded under the current grading policy. Grades received under plus/minus grading (beginning Fall 2012) will receive quality points awarded under the new grading system. An illustration of the calculation of cumulative GPA appears below (Item 10). What is the value assigned to each grade for computing GPAs? Why is there no difference between an A+ and an A in the new plus/minus grading scale? The University Senate approved the awarding of 4.0 quality points for A+ and A grades. Many leading public institutions also assign A+ and A grades the same quality points. Is an instructor for a course required to use plus and minus grades? The plus/minus grading system is the official grading policy of the University, effective Fall 2012. Quality points for each letter grade from A through D will reflect plus and minus components. The assignment of grades as defined in the plus/minus grading policy is the responsibility and the decision of the instructor. Will plus and minus grades be listed on University of Maryland, College Park students' transcripts? 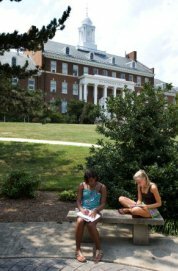 Since Fall 2001, the University of Maryland, College Park transcript has shown any plus or minus grades earned by the student and will continue to do so. Will the new plus/minus grading scale impact the Dean's List (academic honors) policy? The Dean's List (academic honors) policy is based on a given semester’s GPA. Beginning Fall 2012, a student’s semester GPA will reflect the grades awarded under plus/minus grading. According to our Dean's List (academic honors) policy, “Semester Academic Honors (Dean's List) will be awarded to those students who complete, within any given semester (excluding winter and summer terms), 12 or more credits (excluding courses with grades of P and S) with a semester GPA of 3.5 or higher.” Example of GPA calculation for grades earned under both systems. A student’s cumulative GPA depends on the number of credits earned, the grade awarded in each course, and the quality points awarded for each credit hour. Quality points awarded under plus/minus grading differ from the quality points awarded under the current grading policy. All credits earned under the present grading policy will be valued using the quality points stated in the present grading policy. All credits earned under the plus/minus grading policy will be valued using the quality points in the new plus/minus grading policy. Quality points earned prior to the implementation of plus/minus grading (beginning Fall 2012) will not be recalculated. The following example illustrates GPA calculations for a student who has earned one semester of grades under each of the grading policies. The example illustrates how differences in grades and numbers of credits earned in each course are reflected in GPA calculations in the two semesters. The complete policy can be found in the Undergraduate Catalog. Undergraduate academic performance is based on a student's grade point average (GPA). Students are required to achieve a 2.0 GPA to maintain satisfactory academic progress. A GPA under 2.0 is considered unsatisfactory performance. Students with a GPA under 2.0 will be placed on Academic Probation. See "How to compute GPA" below for an explanation of semester and cumulative GPA. Semester Academic Honors (Dean's List) will be awarded to students who complete, within any given semester (excluding winter and summer terms), 12 or more credits with a semester GPA of 3.5 or higher. This recognition will be noted on the student's academic record. Courses with grades of P and S are excluded from the twelve credit determination. Satisfactory Academic Performance is the achievement of a cumulative GPA of 2.0 or above. Academic Probation: Students will be placed on academic probation if their cumulative GPA falls below 2.0. Normally, a student is expected to attain a 2.0 cumulative GPA at the end of any probationary semester. Students who fail to achieve a 2.0 cumulative GPA at the end of their probationary semester may be academically dismissed, depending on their credit level as detailed below. Students who have earned 60 credits or more will be dismissed from the University in the event their cumulative GPA remains below 2.0 at the end of their probationary semester.Students who are on probation and attain a cumulative GPA of 2.0 at the end of a winter or summer term will not be subject to dismissal in the subsequent semester. Students who are on academic probation and have earned fewer than 60 credits will be permitted to continue on academic probation if a minimum semester GPA of 2.0 is achieved in each semester of probation. Full-time students must complete 9 or more credits in each semester. A completed credit is defined as credit for any course in which a student receives a grade of A, B, C, D, F, P, or S.
Students who meet this requirement will be permitted to continue on probation until the close of the semester (excluding winter and summer terms) in which they attain a cumulative GPA of 2.0. Students who are on probation will be dismissed if they have not achieved a cumulative GPA of 2.0 at the end of the semester in which they complete 60 credits. Students who are on probation and attain a cumulative GPA of 2.0 at the end of a winter or summer term will not be subject to dismissal in the subsequent semester. Academic Probation Conditions: The Office of the Registrar will notify students when they are placed on academic probation. Such notices will include a requirement that the students consult an academic advisor in their colleges early in the probationary semester and in no event later than the beginning of the early registration period for the next semester. The Office of the Registrar will notify the colleges of students who are placed on academic probation and will note the academic probationary status on the students' academic record. Academic advisors will assist students in developing appropriate plans for achieving satisfactory academic performance. Students who are placed on probation will not be allowed to add or drop courses, or register without the approval of an academic advisor in their college. Students who have earned 60 or more credits will be dismissed if their cumulative GPA remains below 2.0 for two consecutive semesters (excluding winter and summer terms) Students who attained a cumulative GPA of 2.0 in the preceding winter or summer term will not be subject to dismissal. Students who have earned fewer than 60 credits will be dismissed following any probationary semester in which they fail to attain a minimum 2.0 semester GPA and complete the requisite credits detailed under 'Academic Probation.' Students who attained a cumulative GPA of 2.0 in the preceding winter or summer term will not be subject to dismissal. Students who have been academically dismissed and who are reinstated will be academically dismissed again if a cumulative GPA of at least 2.0 is not achieved by the end of the first semester after reinstatement. Reinstated students will not be allowed to add or drop courses, or to register during any semester without the approval of an academic advisor in their college, unless a cumulative GPA of at least 2.0 is achieved. The Office of the Registrar will notify the appropriate University offices when students are academically dismissed and will note the dismissal on the students' academic record. The Student Success Office will notify students in writing when they are dismissed. The notices will include a statement that registration for the next semester (excluding winter or summer terms) will be canceled. Normally, a student dismissed for academic reasons must wait out one semester (fall or spring) before reinstatement. Exceptions will be determined by the Faculty Petition Board. Applications and information about the reinstatement process can be obtained from the Office of Undergraduate Admissions, which is responsible for administering the reinstatement process in coordination with the Faculty Review Board. Requirements for satisfactory academic progress are based solely upon grade point average. This is computed by dividing the TOTAL NUMBER OF QUALITY POINTS accumulated in courses for which a grade of A, B, C, D, or F has been assigned by the TOTA L NUMBER OF CREDITS ATTEMPTED in those courses. Courses for which a grade of "P", "S", "I", or "NGR" has been assigned are NOT included in computing the GPA. Each letter grade has a numerical value: A+, A, A- = 4; B+, B, B- = 3; C+, C, C- = 2; D+, D, D- = 1; F = 0. Multiplying this value by the number of credits for a particular course gives the number of quality points earned for that course. Note: When a course is REPEATED, all grades will be included for the purpose of determining the number of quality points used to calculate the cumulative grade point average. First semester students and freshmen through the first 24 credits will receive quality points appropriate for the higher grade when calculating the grade point average. MATH003, MATH007, MATH013, and MATH015 carry credit for billing and determination of full-time and part-time status, but are excluded from the calculation of semester and cumulative grade point averages. Charges for Special Math courses are in addition to tuition charges. For more information contact the Mathematics Department at 301-405-5053.